Hi girls! I’m currently sitting in a cafe at Mount Cook Village in New Zealand, listening to the radio and looking out into a beautiful, gorgeous incredible, breathtaking view of the mountains with glaciers on their peaks! I have to be completely honest and say that the last week travelling in New Zealand has been AMAZING - and not just because it’s beautiful here. There’s something to travelling and being on the move and being present that does wonders for manifestation. At least for me, both times that I’ve been away and travelling (in New York during exam period, and now in NZ!) they’ve been big, massive months in terms of money manifestation! (Just a random trend I’ve been seeing since I’ve been travelling). Part of me believes it’s because the travel has helped me BE in my element and be present and just love the energy. — Okay so super cool but as I’ve started to write this blog, the radio started playing a song from my Journaling with KW playlist on Spotify! That has got to be a sign! Anyway - time for some tips on how to turn your Tumblr and Pinterest dreams into a reality! The photo that you see here is one that I truly dreamed of back when I was in high school, scrolling on Tumblr every evening on my mini purple acer laptop. I would look longingly at the faceless girls sitting with their hair waving in the wind in some picturesque view and long to be them. Years later, I’ve been able to take this picture (just yesterday actually!) in the beautiful van that I manifested with Byam to travel through NZ. Here are some tips on how this came true. When I used to look at the Tumblr photos, past me used to think: “oh I wish that was me, why can’t that be me.” And that was the energy I sat in! When you believe it can be yours now and you believe that you’re capable of having it in your reality - you’re on the right track to manifesting it in your reality! That’s exactly how Byam and I came across the exact little van we wanted to travel in. I believed that I could find one and that we’d easily be able to afford it! It’s safe to say it worked. Believe you can have the dream apartment with the light flooding in. Believe you can have the dream bedroom, house, kitchen, accommodation, pool, view - you name it, girl it’s yours when you believe it is. 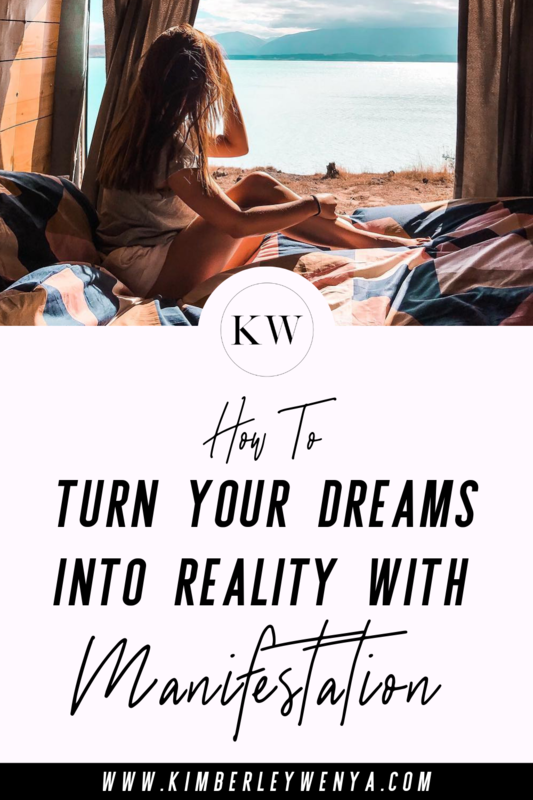 This leads on from the point before, but there is a slight specific difference (which is what makes all KW trainings like Desire Match & The Magic of Manifestation are incredible because we get specific). One element is of course believing it’s yours now, but another point of view to take into account is realising that it’s not out of your league. As long as you believe you’re “not good enough” to have something, it’s always going to be far away and just out of your reach. Believe it’s in your league. Believe it’s yours for the taking. Because you’re truly worthy of it, always - you were and always will be. Understand that there’s a magic to manifestation where you are capable of anything and everything because the universe has your back, girl. You want that job? The universe will help you get it. Want that financial income? The universe can help make that possible. I thought the exact thought when I desired to make 6 figures through my business. And this came true so much earlier than I thought possible thanks to the universe! I’ve learned the secrets and the tips and tricks to let this be possible and have delivered them in a beautiful training just for you, called The Magic of Manifestation. There are only a few last days for you to get 40% off this incredible 2-part training! Click here to check it out! If you’re brand new to manifestation, you’ll also want to check out Manifestation: The Basics. Anyway, that’s all from me this week honeys! I’ll be back in Melbourne by the time this blog is out! I hope you’ve been loving all the KW vibes and manifestation vibes whilst I’ve been away. Let’s just say, big things are coming out for February! (Hint: money manifestation).